Many thanks to Martine and her team with Palmyra Relief Luxembourg. They spent two days in the market’s freezing cold weather raising money for Palmyra Relief from the sale of hand made items (Martine’s creations), raising €1128. This will help us to provide more artificial limbs for the children of Syria. لقد امضوا يومين في السوق في طقس جليدي من اجل جمع المال لجمعية بالميرا ريليف من خلال بيع مشغولات يدوية من تصميم مارتين. وقد تم جمع ١١٢٨ يورو وهذا سوف يساعدنا على تركيب أطراف صناعية للأطفال السوريين المصابين. This entry was posted in Other Issues on December 18, 2018 by palmyrarelief. هذه صورة الطفل محمود حربلية، قبل وبعد تركيب الطرف الصناعي. ابتسامته هي الأمل الوحيد الذي يوحي بالمستقبل. شكرا من القلب لكل من ساهم ماديا ومعنويا برسم الفرحة مجددا على وجه محمود. Thank you to all who supported our past fundraising events for Mahmoud. In March 2016, 70 people joined us for an event, which raised £3,500 to help get a prosthetic arm for Mahmoud. He lost his arm in Aleppo, in the bombing that is a tragic part of Syria’s ongoing conflict. Palmyra Relief successfully coordinated with Dogan Medikal in Mersin, Turkey. Dogan has a healthcare centre whose services focus around the provision and fitting of prosthetic limbs. Please help us with Mahmud’s continued support, therapy, and rehabilitation. Here are photos of Mahmud Harbalyie before and after Palmyra Relief helped with his prosthetic arm. His smile is hope for the future. We have also included a video of Mahmoud learning to use his new arm. Thanks from the bottom of our hearts to all who contributed directly and indirectly to his beautiful smile. 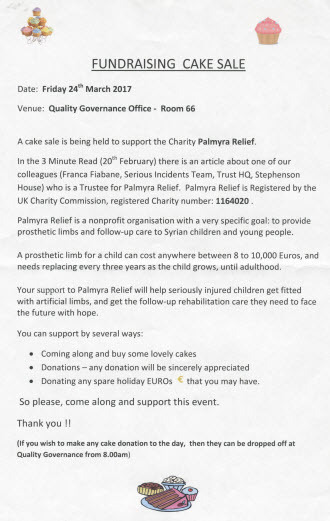 This entry was posted in Other Issues on December 3, 2018 by palmyrarelief. Listen to this interview with Mohammed Antabli, founder of Palmyra Relief, on AlAanFM radio. (Arabic). This entry was posted in About Palmyra, Palmyra Events, Palmyra Success Stories, Radio and Podcasts and tagged About Palmyra, AlAanFM, humanitarian aid, impact on children, Mahmoud, mahmud, mohammed antabli, podcasts, radio, Syrian children on April 4, 2017 by palmyrarelief. This entry was posted in Palmyra Events, Photos and tagged Alwaha restaurant, colin firth, Mahmoud, mahmud, Palmyra Events on March 29, 2017 by palmyrarelief. At the Palmyra Relief Buffet Fundraiser on Sunday March 26, we were honoured to have one of our most dedicated patrons, actor Colin Firth, join us. Colin has been a committed Palmyra Relief supporter since its creation. We are deeply grateful for his continued support, and for joining us in our efforts to help the children. This entry was posted in Other Issues on March 28, 2017 by palmyrarelief.